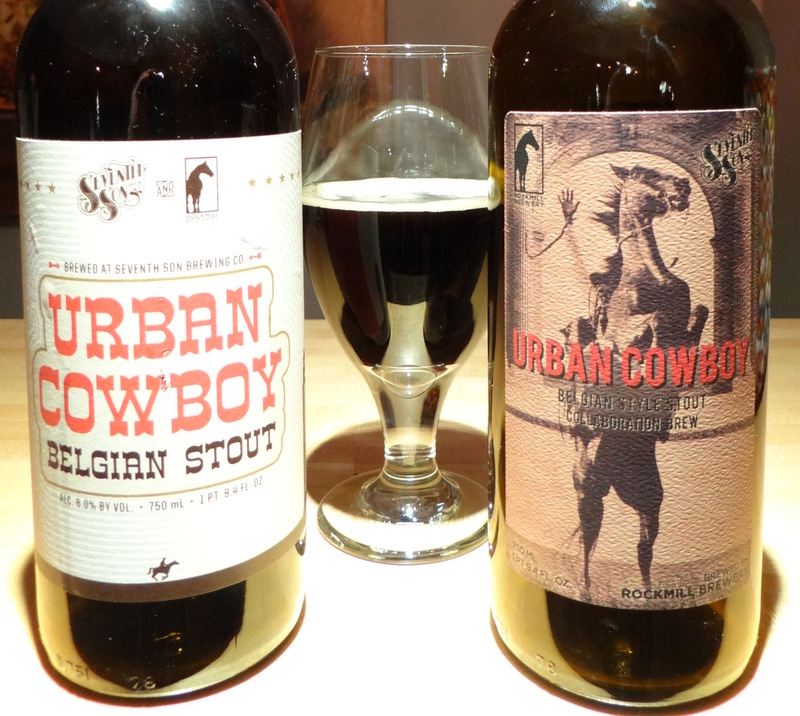 Earlier this year two Central Ohio breweries, Rockmill and Seventh Son, collaborated to brew a Belgian-style stout dubbed Urban Cowboy. As local beer lovers will know these two breweries are something of a contrast in styles. Rockmill is located on a farm near Lancaster, while Seventh Son is located in downtown Columbus in an old auto repair shop. Rockmill specializes in traditional Belgian-style beers, while Seventh Son beers frequently utilize non-traditional ingredients and/or new varieties of hops. Within the Central Ohio brewery scene I would say they lie at opposite ends of the spectrum. Both beers are 8% abv and priced at $12.99 for a 750 mL bottle. My Rockmill Bottle was labeled #824 out of 1500, while there was no similar numbering on the Seventh Son beer. Although both beers followed the same basic recipe, the beers differed in the following ways, as reported in an article by Cheryl Harrison published on January 29 on the Drink Up Columbus website. Both sets of malts were presumably roasted to give the dark color, flavor and aroma of a stout. On the surface the differences seem relatively minor, but as I describe below these differences have a pretty significant impact on the taste. 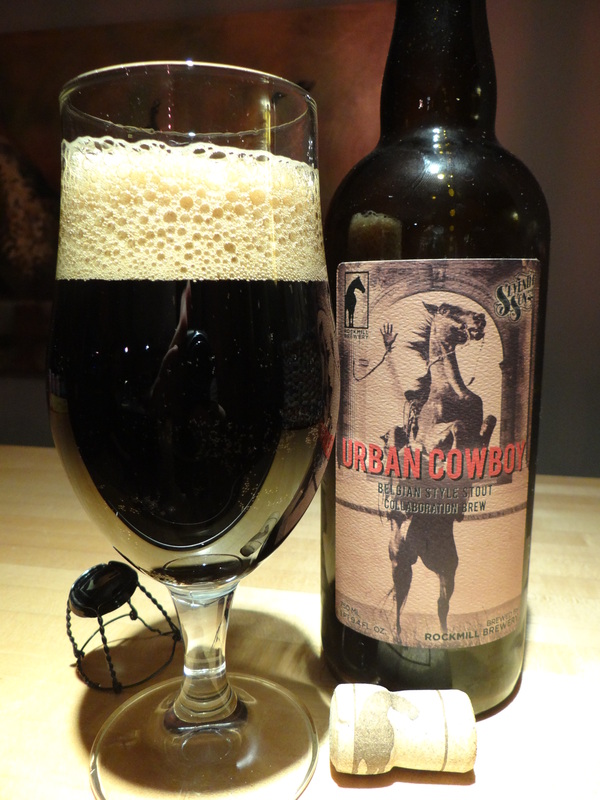 Rockmill’s Urban Cowboy fills the glass with a foreboding opaque black liquid topped by 2-3 cm of beige head. While it may look like an ordinary stout, the Belgian influence is unmistakable once your olfactory senses kick in. The nose is equal parts dark roasted malts and fruity esters from Rockmill yeast. 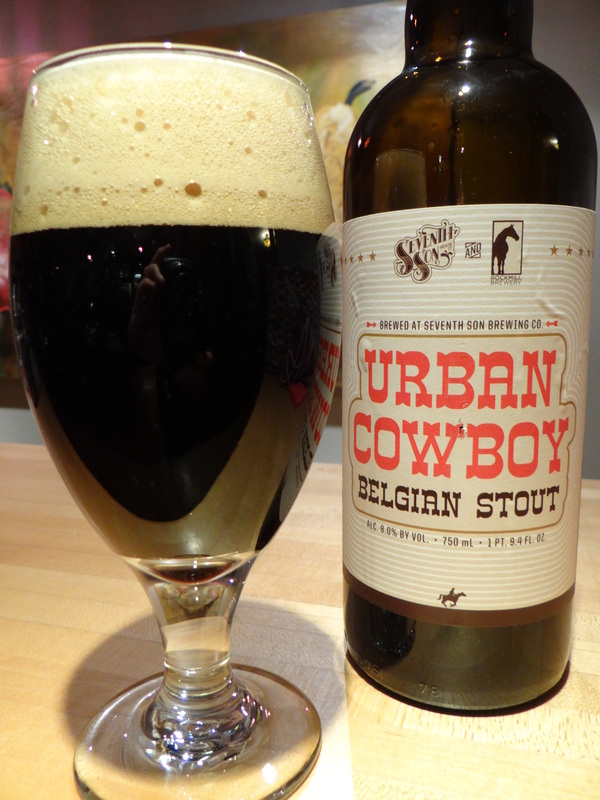 Things diverge even further from a standard American Stout once the Urban Cowboy hits your tongue. Initially you get the dark maltiness of a stout, but those tastes are quickly overtaken by sour, fruity flavors. To be honest it’s a bit of a shock to my senses and I’m struggling to describe funky tastes that hijack the beer in mid-palate. My tasting notes say “sour red grapes”, but I’m sure there is a better description out there. The mouthfeel is on the thick side of medium and there is enough carbonation to keep the beer from being too heavy or cloying. It’s definitely complex and unlike any other beer I’ve encountered, but on the whole I found this to be a challenging beer to love. Once the Belgian side of the beer takes over the sour notes clash with the roasted malt flavors. As the night wore on, and the bottle slowly emptied, my taste buds started to acclimate to the taste. It may be an acquired taste and given enough encounters perhaps I could grow fond of this beer, but as a limited release that is not likely to happen. So for me the Rockmill version of Urban Cowboy will remain a beer that missed the mark. This beer looks just like the Rockmill brewed version. The smell is also quite similar, although the roasted malts may be a shade more prominent here. Only when you start drinking do the differences emerge. In the Seventh Son version smoky, roasted malts accented with hints of espresso lead the way, followed closely by dark plum-like fruit flavors from the Belgian yeasts. There is not much burnt char or spiciness on the finish. The mouthfeel is medium thick and moderately coating, comparable to the Rockmill version. The components of the Seventh Son version are essentially the same as the Rockmill version, but toning down the “Belgian” character makes a world of difference. The Belgian fruitiness nicely complements the roasty stout flavors, rather than clashing with them. In fact I would have to say that this is the best Seventh Son beer I’ve had to date. I plan to go out and see if I can pick up another bottle or two before they all disappear. I’m surprised that my opinion of these two closely related beers is so divergent. Although it is impossible for me to say for sure, I have to think that the difference in the yeast is largely responsible for the difference in taste. Of course the yeasts do all the work in brewing, so I shouldn’t be too surprised. If any readers out there tried both versions I’d really love to get some comments on your preference between the two. Unfortunately the review is a little late in the coming, because it was a limited release there aren’t too many of these left in circulation. The silver lining is that Seventh Son produced more beer (465 gallons) than Rockmill (310 gallons), and there were still some bottles at Weiland’s Market a week ago. So you might be able to snag some if you don’t delay. If the brewers at Seventh Son are reading this post I would put in a request to revisit their version of the Urban Cowboy at some point in the future. *Rating Scale: 10 = perfection, 9 = excellent, one of the top beers in the world, 8 = very good, one of the top beers in its style category, 7 = good, a solid beer I’m happy to be drinking, 6 = average, not bad but not something I’m likely to buy again, 5 = below average, 3-4 = poor, should be avoided, 1-2 drainpour.